Blink, and six months go by. Ever since I made the move from Time Inc. to TechCrunch, my life has become a whirlwind of nonstop blog posting, little sleep, and a growing addiction to news feeds, Techmeme, and my Blackberry. Last week, I wrote my 600th post (this one is No. 617). The boxes I brought over from my previous career are still stacked, unopened, in my TechCrunch office. A lone painting from my three-year-old son adorns the wall. I have not had time to unpack or even buy a bookshelf to put things on. Fourteen years worth of stuff, and it still amazes me I don’t need any of it. The journalist in me has been avoiding this post (too navel-gazing, too self-absorbed), but the blogger in me can’t help it. Media is changing—how it is produced and how it is consumed. The worlds of blogging and journalism are colliding and I want to get some thoughts down on this transition before I forget what the old world was like or feel too comfortable in the new one. (Fair warning: If you don’t like long posts, skip this one). Just as more and more blogs are building up professional writing staffs, more and more newspapers and magazines are requiring that their writers start blogging. 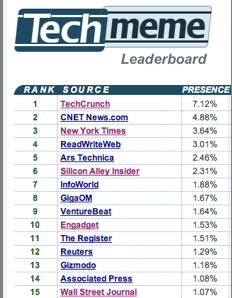 A quick glance at the Techmeme Leaderboard, for instance, shows that its top spots are almost evenly split between blogs and traditional news organizations. Note that the blogs are all of the professional variety, complete with writing staffs (TechCrunch, ReadWriteWeb, Ars Technica, Silicon Alley Insider, GigaOm, VentureBeat, etc.) and that the highest ranking news sites (CNET and the New York Times) also have the most active journalist bloggers. But remember that all the big blogs that have turned professional and are now out there trying to build small media businesses started out as personal. Also, remember that these blogs (TechCrunch included) represent a tiny, tiny sliver of the millions of blogs out there. Unlike others, I don’t draw as sharp a dividing line between professional and personal blogs. Any blogger can rise to the level of contributing to the public discourse. Those that do so on a consistent basis—such as Dave Winer, Robert Scoble, Nick Carr, Mark Cuban, Fred Wilson, and others—gain wide followings, and with that a responsibility to their readers that is equal to any journalist’s. A more useful distinction is that there are sources of information that readers trust and sources of information that they don’t. Once someone reaches that level of trust, their responsibility is to tell the truth as best they can. For me, blogging and journalism began to blur long ago. I took over the Business 2.0 blog (which became the Next Net) from Damon Darlin, now technology editor at the New York Times. That was back in May, 2005, one month before Michael Arrington started TechCrunch—which just goes to show that Michael and I have been on the same wavelength from the start. Of course, back then, he took blogging much more seriously than I did. At Business 2.0, my blog was always a side project—although it grew to 50,000 feed subscribers. I was paid to write, package, and orchestrate articles for the print magazine—in addition to other sidelines, which included organizing mini-conferences and dabbling in Web video. Eventually, blogging became more important to the magazine—all writers and editors had to start one. But it could never quite shake that extracurricular tinge. Putting out TechCrunch is like riding a bullet train. When I jumped aboard, it was already going 150 miles per hour. Six months ago, the main TechCrunch site was attracting about two million visitors a month and it was ranked No. 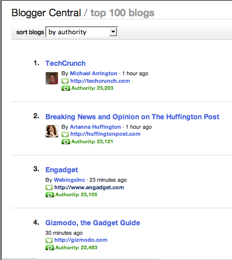 4 on the Technorati 100 list of the most linked-to blogs. Today, six months later, we are within spitting distance of three million visitors a month (2.9 million, to be exact), and last week we overtook Engadget for the first time to reach the No. 1 spot on the Technorati 100. (We’ll see how long that lasts, the Hufifngton Post is right on our tail). So what is the TechCrunch formula? It is hard to say other than obsession. The main TechCrunch blog is written by four of us—Michael, Duncan, Mark, and me. (When I began, there were five, but Nick Gonzalez decided to opt for the comparatively saner hours of a startup). Despite our small size, we are a global organization. When not traveling, Michael and Mark write from California, Duncan writes from Australia, and I write from New York. Somebody is always online—often all of us. Michael literally never sleeps. It is really unhealthy. What we do at TechCrunch is actually pretty simple. We write about Web startups and the larger tech companies that try to either copy or acquire them. Depending on the day, I could be liveblogging the launch of the Amazon Kindle, arguing about free speech in the Internet age, uncovering secret projects at Google, giving Yahoo unsolicited acquisition advice, or writing about a hot new startup. Some people question whether TechCrunch is even a blog anymore rather than a professional media site. But that distinction is becoming increasingly meaningless. The truth is that we are both. We compete with traditional news organizations, but with a small fraction of their staff. That is our competitive advantage. We certainly cover the news and do original reporting, but we also discuss news reported by others and are not shy about voicing our personal opinions. We are as much a filter as a source. There is something about blogging—the immediacy, the give and take, the point of view—that helps it compete with traditional media for attention. And we don’t want to lose that. We like to speculate, argue, and debate—sometimes in ways that traditional journalists may think is unseemly. That’s okay, as long as our readers keep coming back for more. Because what is a blog? It is a conversation with readers. And you don’t have to start a conversation knowing all the facts. But it helps if you end up with more than you start out with, and if you turn out to be right more often than wrong. Otherwise, people will stop listening to you—the same as they would with any media source. 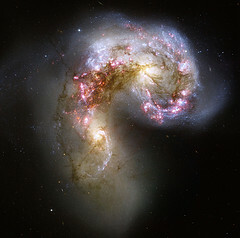 (Hubble Telescope photo of colliding galaxies via Oswaldo).